Hace poco proponíamos que los espacios para la eduación se estaban trasladando de las aulas a los mundo virtuales. Una mudanza muy peculiar que modifica el entorno y, especialmente, la forma de relacionarse con nuestra comunidad y con el conocimiento. Esta mudanza no se restringe, obviamente, a la educación, y se puede observar en las comunidades más diversas. Second Life se está convirtiendo en la plataforma más utilizada para los objetivos más diversos. Además de algunos ejemplos que ya han aprecido por este blog, uno de los proyectos más interesantes e ilustrativos es el liderado por Joi Ito que propone comprar una isla en Second Life donde poder organizar "reuniones de trabajo" de los gremios de World of Warcraft en que participa y otros proyectos en los que está involucrado. Describe la idea y su desarrollo en su wiki. 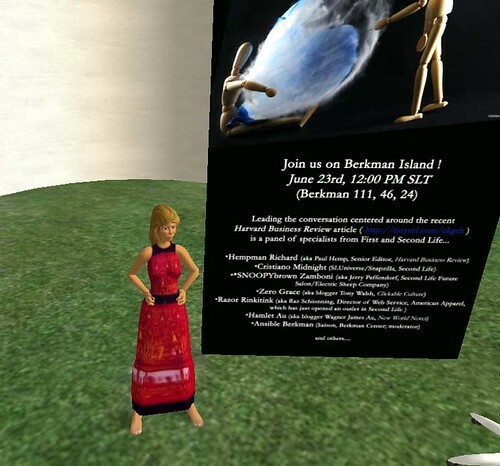 Otro buen ejemplo es el caso de la isla que la Universidad de Harvard posee en Second Life, donde organizan actividades académicas (como por ejemplo la que se cita en este post). Para conocer mejor la naturaleza de este mundo virtual es muy recomendable el artículo de David de Ugarte en su contextopedia sobre Second Life, donde ofrece su visión sobre lo que supone SL como sistema donde se genera de modo artificial escasez (de “propiedades inmobiliarias” o territorios), siguiendo el mismo modelo de burbuja inmobiliaria que conocemos en el mundo “real”, con el fin de que la empresa creadora pueda gobernar el mercado y generar beneficios. Second Life (SL), however, is not a game. There is no imposed storyline. It's more like Neal Stephenson's Snow Crash. Second Life is also not a product, it's a platform. The business model is not based on subscriptions. Instead, users pay for land -- anywhere between US$0 and US$30,000 a month, with the people at the high end running in-world businesses. The land unit is the 'sim' = 16 acres. SL is now approaching 3,000 sims, which is about 3 times the size of Manhattan. In June 2006 there were 100k users, 340k items worth US$6.5m sold. US$1.5m worth of goods were traded directly between users (without conversion to virtual or real currency). The distribution of transactions by size is a power law, so a few people are trading large amounts. This economy is growing rapidly. Hernando de Soto, a Peruvian economist, wrote The Mystery of Capital about the importance if intellectual property (IP) in economic development. Tringo is a game that took off in SL (so much so that people complained about it's in-world social effects). IP rights in SL are transferable to the real world, so the inventor licensed them. Tringo will soon be turned into a UK TV game show. Neil Protagonist is a SL resident who built a whole city devoted to Japanese anime. It took him about 6 months and everything in it is for sale. His real-world wife, SL resident Nephilaine Protagonist, is a graphic artist who makes money in-world as a fashion designer. On the web, user creation has been mainly limited to text. It's also mainly solo and sequential in nature. Only a very small proportion of users add content to the systems (e.g., ~4% for eBay or the web as a whole, 0.02% for Wikipedia, even lower for Linux). Even though SL is quite hard to add things to, about 2/3 of users create something in any given month. SL gets about 140,000 hours of use per day, around 1/4 of which is spent creating things. This is equivalent to 17.5 user-years per day, or a staff that would cost about $650m a year. In any 7 days, about 15% of residents write code (in a rather difficult language similar to C). The monthly total is equivalent to the amount of code in MS Office. Some users staged alien abductions, but only infrequently so other people didn't take the reports seriously. ;) This is a good example of completely unpredictable uses of SL. There was also an SL tax revolt. Users set things -- and themselves, and newly arrived users -- on fire in order to protest against the economic model being used by Linden Lab. The model was changed as a result. Residents are not all geeks. By hours of use, it's almost exactly 50/50 male/female; the median age is about 33. The older you are, the more likely you are to continue using SL. Women are more likely to continue using SL than men. Most SL users are not 'game players'. 75% are in the US. SL contains 100s of millions of user creations, 10s of millions of avatars, and millions of scripts, many of which are shared. Anshe Chung is a real-estate baron in SL. She buys virtual property from Linden Lab, makes it look better, divides up the land and sells it on. As a result of the publicity she's received, she now has a lot of competition. SL is full of amateur-amateur education. E.g., the Black Library, which invites writers to come and add to the library (and the bar helps attract them). Skydiving is also popular. The people who first popularised it make money selling parachutes. Last semester, 17 universities used SL for distance learning. These activity are continuing to grow. 50 universities own land in SL for research or other purposes. The 'International Space Flight Museum' was built by NASA engineers in the their spare time and contains (virtual representations of) all the NASA manned launch vehicles. Virtual classrooms. The 'hypercello' allows composition of music. Drawing classes in SL that allow people to draw in the real world, upload the images to SL and discuss them with (virtual) classmates. Exploratorium: A live in-world web cast of the last solar eclipse was accompanied by a permanent virtual display explaining the solar system. Publishing: The 'Metaverse Messenger' is perhaps the most popular in-world weekly newspaper. O'Reilly's 'MAKE:' magazine also has a presence in SL. Phil Torrone, the editor, has a (real-world) watch that tells him when someone arrives on their (virtual) land so that he knows to log on. SL Community Convention: 6 people arranged a real-world conference, with all the planning taking place in SL. The conference itself was streamed by video into SL. One user was present in the real world and in SL! SL movie theatres allow people to watch movies together and talk about them (which you can't do with web streaming). The Beyond Broadcast Conference (held by the Berkman Center at Harvard) took place in the real world and SL simultaneously. SL participants could ask questions of real-world speakers and could chat about the conference afterwards with other SL residents. Play versus work is a false dichotomy: One user played live music in SL and put out a hat for tips to make money.